Following the skimpy information provided in both the mandate checker and PCO’s Departmental Performance Report (DPR), I had asked PCO for more details and they were reasonably quick in getting back to me. “…In February 2016, the Prime Minister announced a new approach to Governor in Council—or GIC—appointments that supports open, transparent, and merit-based selection processes for GIC appointments. Significant progress has been made in making appointments. Since March of this year, the number of appointments made under the new approach has increased approximately 300%. To date, over 19,000 applications have been received and over 400 appointments made following an open, transparent, and merit-based selection process and approximately 740 appointments made through other selection processes. Obviously, this is approximate but provides a basis for comparison with other EE data. Looking at the total number of GiC appointments (1182 in the index as of today, 40 percent women would mean about 473 women or more. I would hope that in the future PCO would be able to provide annual tables similar to the EE reports for the public service (simplified) that would essentially tell what is a good news story more effectively and consistently. And that future DPRs are more informative. Leave it to others to comment, particularly those with experience in dealing with the IRB. Like all GiC appointments, there is a strong political element (and has always been). 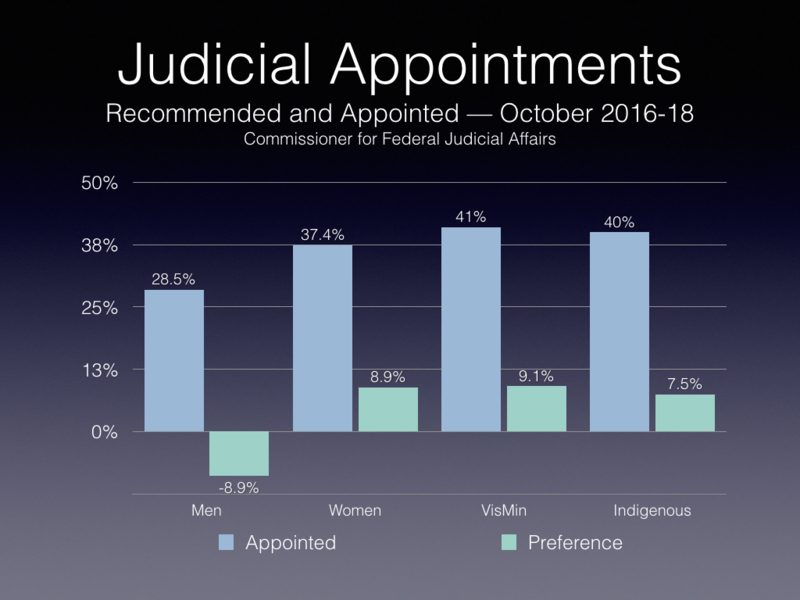 The delay in appointments appears to be characteristic of the government, partially due to its commitment to increased diversity in appointments, but one that affects the timeliness of decision-making. A slew of seasoned decision-makers tasked with hearing refugee and immigration appeals have either left or will depart from their job in what some call the Liberals’ “housecleaning” of Conservative appointees. In light of what some critics call inadequate funding and a growing backlog stemming from the recent spike in asylum-seekers crossing into Canada via the United States, the loss of the adjudicators on the immigration and refugee appeals tribunals is expected to toss the system into disarray. “Our concern is the government is continuing to have a governor-in-council appointment process that is political and discretionary instead of going for a transparent process to appoint the most suitable candidates who are competent, judicious, fair-minded and efficient,” said Raoul Boulakia of the Refugee Lawyers’ Association of Ontario. The Immigration and Refugee Board, which oversees both appeals tribunals, said 14 appointees have left their job since last August and another 39 will have their appointments expire by the end of this year. The board confirmed a total of 42 people applied for reappointments to the tribunals, but would not say how many have been successful. Currently, 23 of the 58 positions at the refugee appeals tribunal are unfilled while the immigration appeals division has six vacancies out of the full complement of 44 appointments. Like the court system, the refugee and immigration appeals tribunals require adjudicators to have stronger knowledge and experience with the administration of the law in order to review decisions by lower-level refugee judges or immigration officials, who are civil servants. While failed refugee claimants — and sometimes the immigration minister — can appeal to the refugee tribunal any questionable decisions made by asylum judges, rejected immigration applicants in sponsorships or those facing removal orders can take their cases to the immigration appeals tribunal. As of the end of December, the immigration appeals tribunal had a backlog of 10,206 cases and a processing time of 20.4 months (compared to 17 months in 2013), while the refugee appeals division had 1,938 cases in the inventory with the average processing time at 124 days (compared to 65 days in 2013), said the refugee board. Under the old system by the former Conservative government, existing adjudicators seeking reappointment to the tribunals would have all their previous decisions evaluated in terms of quality and quantity before being recommended by the board chair based on their track records. However, last summer, the Liberal government, which ran an election campaign on transparency and bipartisanship, rolled out a new process for those already sitting on the tribunals by requiring them to reapply for their appointment and pass an online test. They are then interviewed by a hiring committee made up of the refugee board chair and one representative each from the Prime Minister’s Office, Privy Council Office and the Immigration Department. The composition of the committee opens the door for partisan selection, Boulakia said. “All candidates seeking appointment to a GIC position with the Immigration and Refugee Board, be they incumbents or new candidates, are subject to a rigorous selection process developed for the position, which includes inputs and insights from the independent bodies, including the chair of the refugee board,” said Mistu Mukherjee, a spokesperson for the PCO. Adjudicators who took the test said the questions had nothing to do with immigration and refugee laws and complained they had no way to review the exam or find out why they might have failed. “The process is partisan and not based on merits. They are cleaning out anyone who was appointed by the previous government, whether they are really affiliated with the Conservatives or not,” complained one adjudicator, who underwent the process and asked not to be identified for fear of repercussion. “What happens is you feel you are shackled to a political party with your job security resting on the whim of that party. But you are not supposed to get involved in any politics. It is just so wrong when you are not assessed by your performance and good judgment but by who you know,” said the source, whose appointment was not renewed. Refugee board spokesperson Anna Pape said it is not a requirement for appointees to have experience in refugee and immigration matters and “(complete) training” is provided to all new decision-makers, regardless of their education or experience. Good follow-up story and valid concern regarding the large number of vacancies. Five months after Prime Minister Justin Trudeau’s government assured Canadians that its new system would soon fix the backlog of appointments that need to be filled, the problem has gotten much worse. In several cases, positions are being filled on a temporary basis because the government was not able to fill them before the incumbent’s term was set to expire. Among them are half of the officers of Parliament — the conflict of interest and ethics commissioner, the commissioner of lobbying and the official languages commissioner, while the chief electoral officer’s position is listed as vacant. Former prime minister Stephen Harper’s government went on an appointment spree in the weeks leading up to the 2015 election, filling not only most of the positions that were vacant but also making 49 “future appointments” of individuals whose terms weren’t due to be renewed until well after the election. “The more rigorous approach to conducting selection processes represents a significant volume of work,” said Raymond Rivet, spokesman for the Privy Council Office. Clement blamed the backlog on Trudeau’s director of appointments, Mary Ng, who announced Feb. 15 that she was taking a leave from her job to seek the Liberal nomination in the Toronto-area riding of Markham-Thornhill. The riding became vacant after Trudeau appointed former immigration minister John McCallum as Canada’s ambassador to China. Almost a year in, one would expect more vacancies to have been filled, given the overall policy – greater diversity – is clear. But I can also see the wish to ensure that the details of the policy and its implementation are addressed first. One of the key things to look for is the degree of transparency in political appointments, with comparable employment equity reporting to the public service and federally-regulated sectors (telecoms, banking, transport). Currently for judges, only gender is tracked. 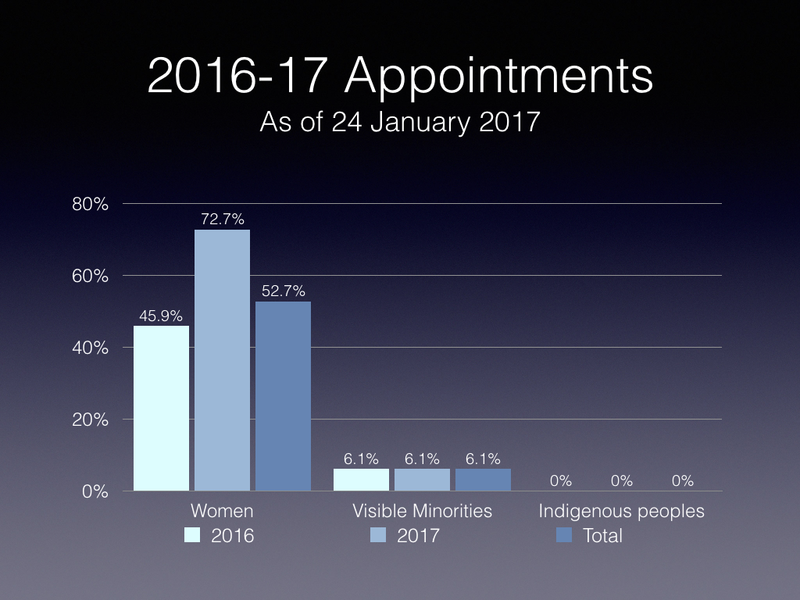 For other GiC appointments, while gender has been tracked comprehensively for 25 years (as has official languages), there has been little systemic tracking of the other groups (visible minorities, Indigenous peoples, persons with disabilities). And in some cases, there has been backsliding: the GiC appointment index (top view) has less information than previously, requiring more looking at the individual organizations than before. 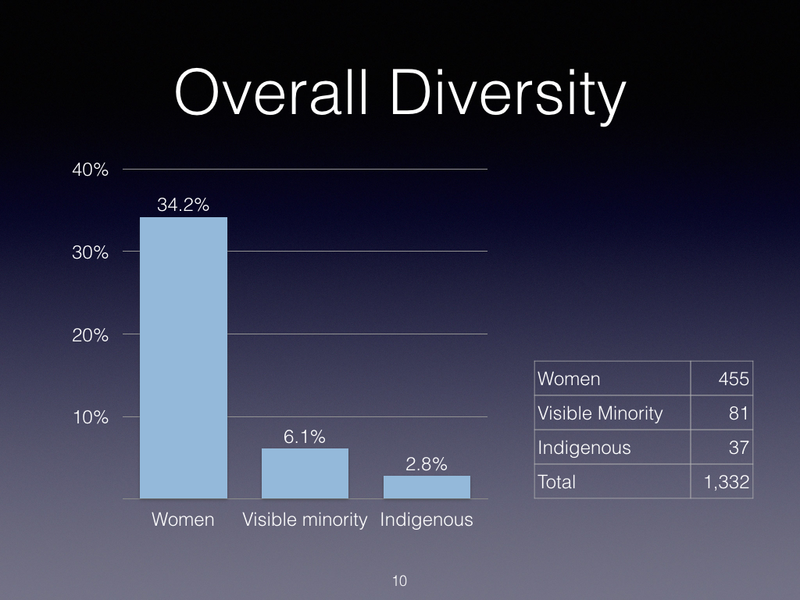 For my baseline study, see my short ebook, “Because it’s 2015 …” Implementing Diversity and Inclusion, available either in an iPad/Mac version (iBooks) or Windows (pdf) Version. Prime Minister Justin Trudeau and his cabinet have accumulated a backlog of more than 300 appointments that are due to be filled, a CBC News investigation has found. Almost 20 per cent of governor in council (GIC) appointments, which include roles with Crown corporations, port authorities, agencies and tribunals, are currently vacant or occupied by a Conservative appointee whose term is past its expiry date. Currently, 61 federally appointed judge positions are vacant, including one seat on the Supreme Court of Canada. In the Senate, 20 per cent of the 105 seats are empty. The government has pledged to fill the 21 spots “by the end of the year.” Three more senators are due to retire in January. For example, Graham Fraser’s appointment as commissioner of official languages, which was set to expire Sunday, was extended Thursday for two months. The government has yet to issue a job posting to find his successor. The backlog has taken a toll on the operations of some boards and government bodies. The CRTC hasn’t been able to hold a planned hearing on French music since November because it doesn’t have the necessary three French-speaking commissioners. The parole board, where 21 per cent of positions are currently vacant, says it’s being stretched, with its remaining part-time board members putting in additional hours to ensure the work is done. Alberta judges warned a Senate committee in late September that the 61 vacant judge positions could affect court proceedings, saying the province’s justice system is so backlogged they are now setting trial dates for 2018. Last week, an Edmonton judge stayed a murder charge against Lance Matthew Regan, citing delays in bringing the case to trial caused in part by the backlog in Alberta’s justice system. The government is confident the problem will be resolved soon. It says the backlog was caused in part by the decision to overhaul the appointments process and bring in a more open, balanced, merit-based system. The new system is now up and running and vacancies are being filled, officials say. While Prime Minister Justin Trudeau is considering his first appointment to the Supreme Court of Canada – a vacancy became available on Sept. 1 – the shortage of lower-court judges may make it difficult for some jurisdictions to meet constitutional guarantees of timely criminal trials. In July, the Supreme Court of Canada set a deadline of 30 months in superior courts (such as the Court of Queen’s Bench) from the time a charge is laid until the trial is completed. In Calgary, the wait is now just short of 15 months – 63 weeks – to schedule a trial of five days or more. (It can take months from the time a charge is laid until a trial is scheduled.) The situation is about the same in Nova Scotia, where the Supreme Court is now booking criminal trials of five days or more for next fall. Civil trials, too, face long delays, which Chief Justice Wittmann said is especially hard on families seeking resolutions to legal problems. The lead time to schedule a civil or family trial of five days or more in the Court of Queen’s Bench in Calgary is now 138 weeks – bookings are being accepted for April, 2019. The Court of Queen’s Bench is Alberta’s top trial court, and it has seven vacancies and 59 full-time judges in office, according to the Office of the Commissioner for Federal Judicial Affairs. The province’s Court of Appeal has two vacancies and 12 full-time judges in office. In Nova Scotia, the Supreme Court (the top trial court) has five vacancies and 31 full-time judges in office. The Court of Appeal has one vacancy and seven judges in office. “On rare occasions in the past we’ve had to cancel matters. However, this is the first time we’ve had to send out multiple letters the month before suggesting that trial dates be rescheduled due to the shortage of judges,” Jennifer Stairs, the communications director for the Nova Scotia judiciary, told The Globe in an e-mail. B.C. has eight vacancies and 82 judges in office on its Supreme Court, and three open spots and 12 judges in office on its appeal court. Five-day criminal trials are available in January, 2017, while five-day civil trials, other than motor-vehicle actions, can be booked from August, 2017, onward. Dates for five-day motor-vehicle action trials are fully booked for the next 18 months, according to Superior Courts communications officer Bruce Cohen. The Canadian Bar Association, representing the country’s legal profession, is also upset at the delays in appointing judges. “We are very concerned. Ongoing judicial vacancies have created significant delays in the court system. These delays have a serious impact on separating families and their children, on criminal justice, on business in Canada,” CBA president René Basque said in an e-mail. Like many such changes, the proof will only become apparent after a few years, when over 50 percent of GiC positions have been renewed or replaced. From my perspective, the application of the diversity and inclusion agenda to appointments, hopefully accompanied by annual reporting, will help judge whether Duff Conacher or Alex Marland are correct in their initial assessments. My take, given my focus on diversity issues, is that we will see an increase in women, visible minorities and indigenous peoples, along with other aspects of diversity, although the “values” of appointments will be largely aligned to the Liberals, just as the previous appointee values were aligned to the Conservatives. “The Conservatives, for most appointments, put an ad up on that website, sometimes put an ad in a newspaper, usually had a headhunter firm, for lack of a better term, do the search for candidates … the Conservatives kept on claiming ‘we’re doing this new way of appointments,’ but the key is the headhunting firm or whoever did the search would just put a list that was a completely advisory list to cabinet and cabinet or the prime minister could choose whomever they wanted,” said Mr. Conacher. “We are committed to raising the bar on openness and transparency in government to make sure that it remains focused on serving Canadians as effectively and efficiently as possible. Government must serve the public interest, and remain accountable to Canadians,” reads a quote from Mr. Trudeau on the release (there is no corresponding event or actual in-person announcement indicated). As indicated online, the “new approach will” require all GIC opportunities to be advertised online, as well as in the Canada Gazette, and GIC candidates will complete an online profile of their personal background (including language and identity group) in order to try to ensure diversity in appointments. “Additional online and/or print media may be used in some cases,” reads the website. “Each rigorous selection process will be based on advertised selection criteria developed for the position, and assessment of candidates against the criteria,” it reads, adding this assessment is then provided to the minister responsible. Members of these selection committee “will be chosen to represent the interests of those who are responsible for decision-making on appointments (the minister, the prime minister), as well as individuals who bring a perspective on the specific interests and needs of the organization,” reads the frequently asked questions section. The February release indicates this “will be” the new process for GIC appointments, and “the Governor in Council appointment process does not require the approval of Parliament,” said PMO press secretary Cameron Ahmad, when asked what’s required to formalize the new process posted online. “The process is currently being implemented and applies to Governor in Council appointments. It was made public in February,” he said, adding “the Privy Council Office supports the prime minister with respect to governor in council appointments” when asked which department drafted the new process. The Liberal government’s new “rigorous approach to appointments is based on the principals of open, transparent and merit-based selection processes that will support ministers in making appointment recommendations for positions in their portfolio,” said Mr. Ahmad, when asked why ultimate discretion to recommend to the GG lies with cabinet and the PM. “The new approach raises the bar on openness and transparency in government and supports accountability to Canadians,” his response continued. “This is one of the greatest areas of cabinet power,” said Mr. Conacher. As well, he said all positions should be advertised widely online, including on popular public job sites (like Monster Jobs, for example). Alex Marland, associate professor of politics at Memorial University, said if the “composition of the group of people making the [GIC appointment] recommendations have deep Liberal connections” it’s hard to “put a lot of faith that this is any more than window dressing.” But he also said he doesn’t worry about cabinet or the PM having discretion over such appointments. “I actually think that’s necessary, because ultimately cabinet is accountable to Parliament, and ultimately cabinet has to run the government, so how could the government function if somebody is being recommended to a position and cabinet is bound to appoint someone who they realize the can’t possibly work with or who will undermine what they’re trying to do,” said Prof. Marland. “In the interim, our Government is moving forward on measures that will facilitate appointments to fill highly pressing judicial vacancies as soon as possible,” reads her response. There are currently about 46 vacant seats on the benches of federally appointed superior courts across Canada. As well, back in December, the Liberals announced the creation of a new Senate appointment process with the Independent Advisory Board for Senate Appointments.